Do you love Chicken Soup for the Soul books? Well, I do!! 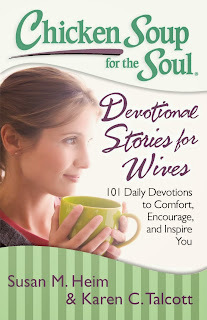 So, I am so excited that I get to give away 3 free copies of Chicken Soup for the Soul: Devotional Stories for Wives – 101 Daily Devotions to Comfort, Encourage, and Inspire You . You can check out my review here. You will love this book. Of course, you might want to get another copy for a loved one. These books make great presents. So, you might want to decide whether or not you will keep this book or give it away if you win. Anyway, it is super easy to enter. Just use the Rafflecopter form below for your chance to win. You even have 5 daily entries available. I love the Chicken Soup for the Soul books.